Here’s a revelation for you. Dull grey light is perfect for Fall Photography. Autumn is one of the best times to make beautiful photographs and that dingy grey light gives you superb, low contrast conditions for some inspiring shots. You can also get some spectacular effects from the lower sun light and if you’re really lucky – MIST. Here are my 8 Fantastic Fall Photography Tips. 1 – Rain or shine, the time to shoot is now. Don’t be put off by grim and overcast skies. Even if it’s raining, you’ll still get some great shots. Depending on your scene, a good solid rain can often look like mist in your image, just make sure your rain cover does a good job and keep the lens dry. 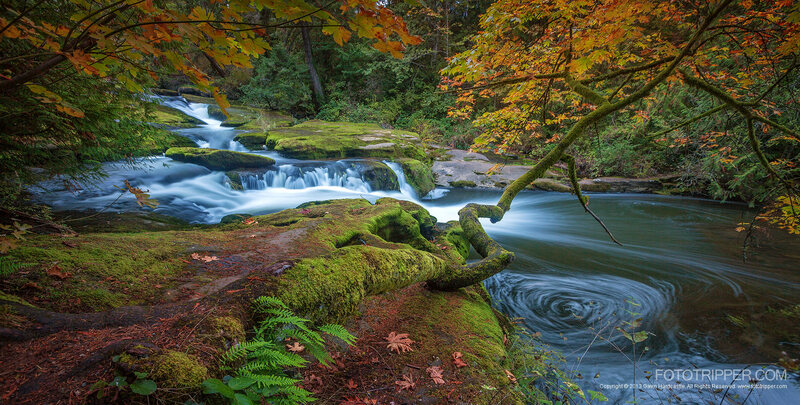 With fall photography you’ll often find yourself in canyons and creeks that get very little direct sun light. This is ideal for soft, low contrast light that won’t require HDR techniques. I know I always say this but if you’re serious about your outdoor photography, you’ll need a good solid tripod that keeps your camera completely still while shooting. Low light situations will force you to use a long exposure so forget going hand held. If you intend to shoot waterfalls and rivers you’ll probably want a slower shutter speed to capture the motion of the water so the tripod will be essential. If you increase your ISO settings you’ll loose sharpness due to light diffraction. Unless you absolutely have to go higher, I recommend setting your ISO as low as possible. In low light situations this will slow down your exposure which you may or may not want. Newer cameras are better at squeezing out more light in high ISO shooting situations but there’s a limit. 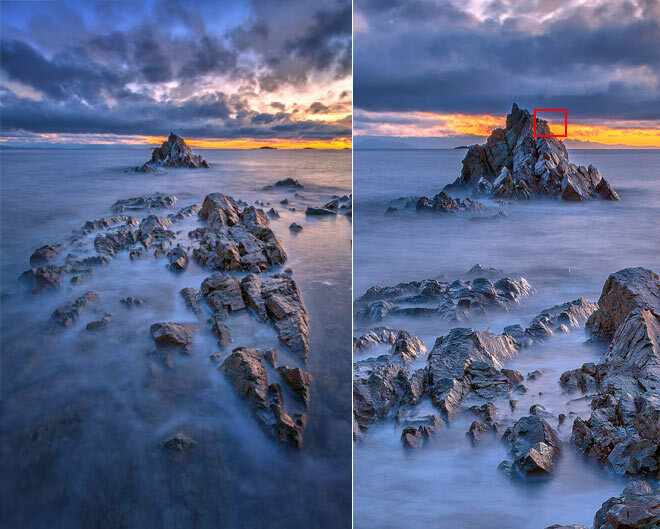 You’ll see a noticeable drop in image sharpness passed ISO 400. 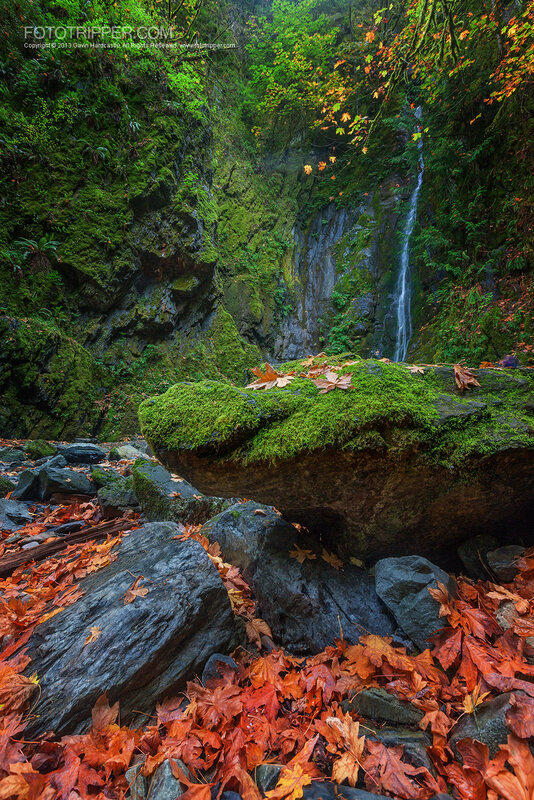 In low light situations that feature rich fall colours, a polarizer can mean the difference between a ‘meh’ photo and a ‘whoah’ photo. You’ll be amazed at how well the colours POP when you slide that polarizer into gear to reduce all the reflected white light in your autumn scene. Colour saturation will be magnificent with a polarizer and that’s what Autumn is all about. 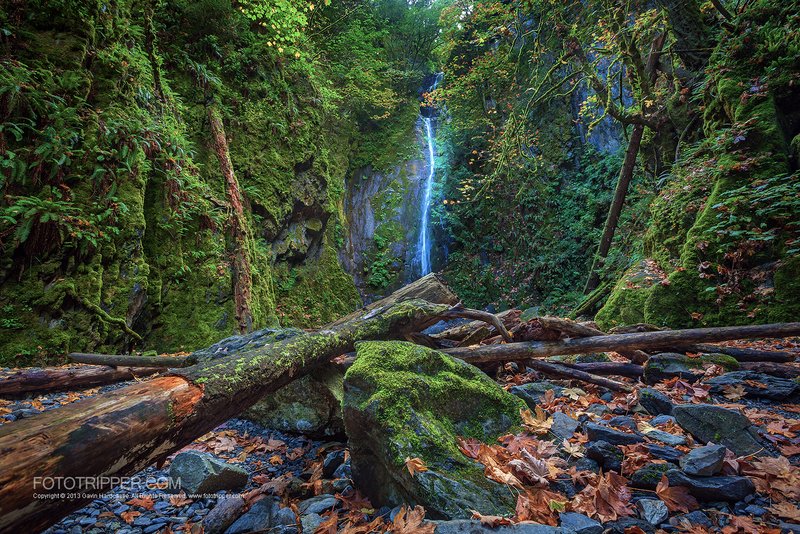 If you’re shooting waterfalls, forests, rivers and creeks, try to compose your shot to exclude the sky if it’s not doing anything interesting. By all means if the sky is offering some lovely clouds or colours then go for it, but if it’s an overcast day and the sky is simply white or grey its best to leave it out of the image altogether and fill your frame with interesting colour and texture. Obviously I’m a fan of the big wide open landscape but Fall also offers some great macro photo ops. Leaves of all kinds mingle together with different shades of yellow and rust. The often wet conditions of autumn will also saturate your colours and offer rich blacks and vibrant reds. Nothing creates visual atmosphere like mist. Mornings are more likely to give you mist and fog but evenings can also bring a cinematic mist to a scene too. With moisture in the air and rapidly changing temperatures, there’s a good chance you’ll capture that magic mist. You’re also more likely to find mist wherever there is water, ponds, marshes, lakes and bogs. As I mentioned earlier, certain kinds of rain can also create the impression of mist so don’t be put off by a light drizzle or even a heavy rain. If it’s windy and the rain comes sideways it might be time to pack up and go home. If you’re lucky enough to be shooting a scene that features mist or a ‘mist-like’ rain you should abandon using your auto focus. Your camera will struggle to focus on objects that are obscured or blurred by atmospheric conditions. Instead, use your cameras ‘Live View’ mode so that you can focus manually. Stay safe during your autumn photo shoots. I recently had a few close calls in some dangerous canyon situations because of slippery footing and treacherous trails. Be careful when climbing or walking across slippery rocks that are covered in slime. God forbid anything should happen but if you plan on going out alone be sure to let someone know where you are and where to send the cavalry if you’re not back by a certain time. Many canyons have poor cell phone reception so make a contingency plan if things go South. If you found these Fall Photo Tips useful please leave a comment and add your own tips for our readers. I appreciate the tips and the pictures are gorgeous, im looking to getting into photography on a more professional level making it a possible career. Nice article. I’m curious about what kind of polarizers would you recommend. As with anything, get the best you can afford. I use Hoya and Heliopan.